The American Women’s Hospitals at Home: Public Health in Depression-Era Appalachia | Doctor or Doctress? This story explores the public health work of the American Women’s Hospitals in rural Appalachia. 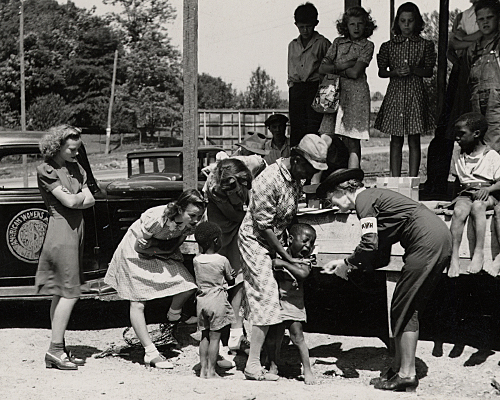 The pamphlets, photographs, and reports featured provide a "boots on the ground" view of rural poverty in the 1930s. The records of their efforts offer one answer to the question of how Americans attempted to address the problems facing individual communities that were caused or exacerbated by the Great Depression. This story may be integrated into a broader evaluation of how the circumstances of the Depression led to a call for both private and public welfare programs throughout the United States. Using the "Protect yourself from pellagra" pamphlet, evaluate this month's school lunch menu for its effectiveness at preventing this disease among students. Use a graphic organizer to study each source and identify 1) the living conditions in rural Appalachia and the problems residents faced that made staying healthy challenging, and 2) the specific programs and actions the AWH carried out to address these problems. Extension: Use this list to write a letter to a US congressperson in the 1930s with a goal to persuade them to include funding for the AWH as a part of a New Deal relief package. Have students research their local community center or public health department and identify the programs in place to keep their own community healthy. As a class, discuss: How effective are they? How do these initiatives compare to the AWH's work for communities in rural Appalachia? Why is pellagra not still discussed as a major health issue? What is an equivalent health problem today that many Americans face? Do you see more public health programs today run by private organizations or the government? Which do you think would be more effective? Evaluate the images included in the fundraising pamphlets (1, 2). Who was the intended audience for these pamphlets? What would have made the images they included effective? Consider the general time period of this story. What might have contributed to the AWH's difficulty in funding their work? How did the rural setting of these AWH units affect how they carried out their work? Were the AWH's actions more focused on addressing short-term needs or providing long-term solutions? "Echoes of the 1930s in Health Care Debate." John McDonough. All Things Considered. National Public Radio. Washington, D.C. August 28, 2009. Helpful context about the larger debates surrounding public health in the 1930s, with a focus on the national government’s role in the healthcare industry. Explores how people at that time addressed questions about the larger society’s role in preserving the health of individuals. "The Mistaken Case of the Killer Cornbread." Mark Essig. Atlas Obscura, January 24, 2017. Accessed 1/30/2018. Provides a look at pellagra through the lens of social history, as well as some general information about the disease and its causes. Franklin D. Roosevelt, Fireside Chat no. 2. Radio address, May 7, 1933. Miller Center. The AWH's work in Appalachia was just one of the ways Americans tried to address the problems caused and/or exacerbated by the Great Depression. The AWH was a private organization, but the major force in this effort was the federal government, in the form of the National Recovery Administration.